it sends a follow-up email to contacts who visited the page with your selected product category but didn’t convert. The email should refer to the product category viewed by the visitors. it checks whether any of the recipients who received the second email converted. If they did, they get a tag: converted_thanksgiving. an automation message or message (or draft) that can be used as one. 1. The Message sent condition is preset to any message. Click the element to open the Properties tab and select the Thanksgiving-themed offer you’ll be sending out. Be sure to schedule the message before you start configuring this element. 2. Configure the URL visited elements to track visits to your selected product category. The wait time properties for the condition should be set to Never. a. Click the element. This will open the Copy JavaScrip Code popup. b. Click Copy code to copy the snippet to the clipboard and close the window. (At this point it’s best to save it to a temporary document in case you copy something else to the clipboard). c. Under Properties, enter the URL of the product site you want to track. Use a wildcard if you want to track visits anywhere on your site. To learn more about configuring the element and using wildcards, go to How do I set properties for the URL visited condition? 3. Follow the instructions from Step 2 to configure the URL visited elements to track if your contacts reached the post-purchase thank-you page. The wait time for the condition should be set to 2 days. After this time, customers who don’t complete their purchase will go down the negative path and receive a reminder email. For the Tag action attached to the “if yes” (green) connector of the URL visited condition, select the tag to assign to contacts who took advantage of your offer, e.g. “converted_thanksgiving”. 1. 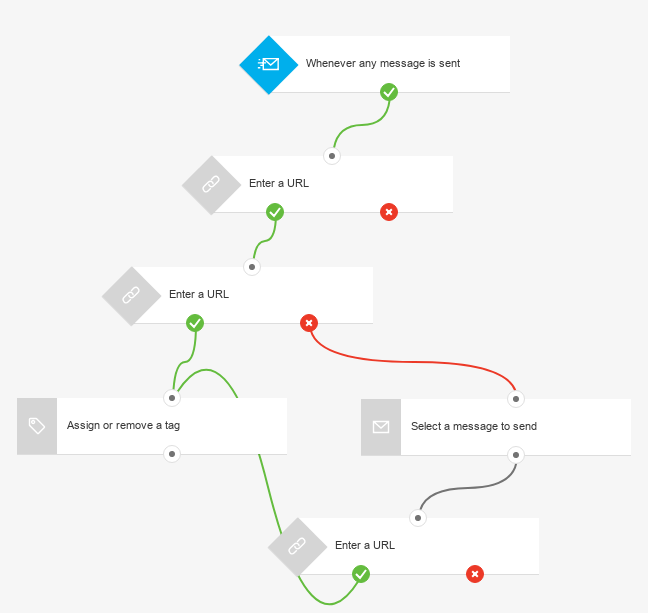 For the Send message action linked to the negative (red) connector of the URL visited conditions, select the message with the follow-up offer. 2. Follow the instructions from Step 2 to configure the URL visited element. It will track if your contacts reached the post-purchase thank-you page. In the remaining URL visited conditions, enter the URL post-purchase thank-you page for a given product. The wait time properties for the condition should be set to Never because this time we’re targeting only the contacts who’ve converted. Click Save and publish when you’re done setting up the template or Save and exit if you want to finish editing the template later (it will appear as a draft on the Manage workflows page).